Can Pixar Still Go Up? A still from Disney and Pixar's . 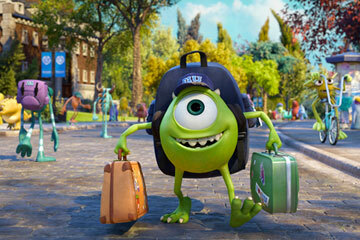 Among the freshmen at Monsters University, Mike Wazowski stands out like any creature who's basically an eyeball with feet would. With the brains, drive and guts to be a BMOC (Big Monster on Campus), Mike lacks just one talent: shock appeal. His "Boo!" is a lullaby to kids who need the sleep scared out of them. "If you're not scary," the dean says, "what kind of a monster are you?"